Deer can feed anytime, but as prey animals, they tend to prefer the cover of darkness instead of broad daylight. They browse for tasty treats often found in open fields, then they dart into the safety of the woods or a thicket to chew their cud and watch for danger. In the fall, deer eat more often, to help build up fat supplies to get them through the harsher winter months. Deer are crepuscular, which means they are most active at dawn and dusk. During these times, the deer's wide eyes take in plenty of light to see their paths to their favorite food sources, at a point when most predators are struggling to see clearly. They leave the safety of vegetation to search for food more often in the low-light hours than at any other time during the day. Deer tend to be more active at night than during the day. Deer enjoy feeding in the relative safety of the night, sneaking into meadows and clearings, or sometimes gardens and yards. In areas where deer are present, it's not uncommon for homeowners to awaken to decimated flowerbeds or crops that were perfectly healthy when the homeowners went to bed. 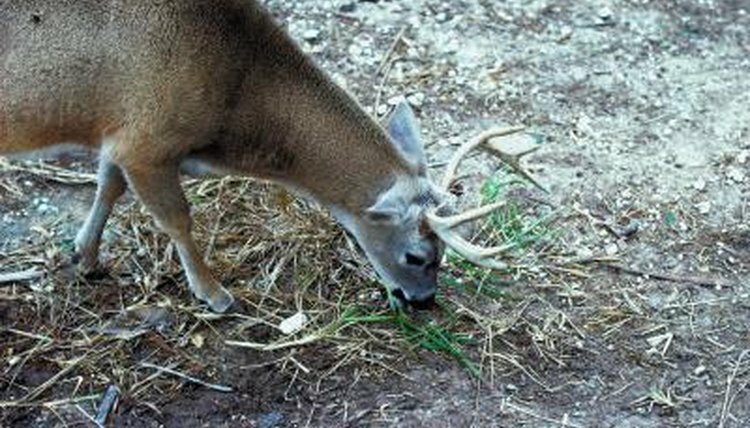 The time of year can affect how deer feed. Food is scarce in winter, so deer prepare for this by being more active than normal during the fall. Fall, which also coincides with mating season, is when deer are more likely to feed during the day than any other time of year. They continue to seek plants in open fields in the fall, but they also browse for nutrient-rich nuts and acorns to help gain fat to survive the winter. In the spring, new plant growth helps the deer become more active than during the winter months, getting back on their crepuscular schedules. They maintain this schedule throughout the summer. What deer eat is determined by what's readily available and the time of year. Spring brings fields of alfalfa and clover, favorites of deer. They also enjoy weedy plants such as dandelions. In summer, most plants are vigorously growing, giving deer a variety to choose from. In addition to their spring favorites, deer enjoy the foliage of berries such as blackberries, weeds such as ragweed and asters, and vines such as honeysuckle or grapes. As fruit begin to ripen in late summer and fall, deer enjoy treats such as fallen or low-hanging apples and pears. They expand to acorns in the fall, and they enjoy ryegrass and wheat. In winter, deer stick to mostly woody plants, eating the tips of branches of trees such as willow, oak and red cedar. Arkansas Game and Fish Commission: What Do Deer Eat? Buckmasters: What Do Deer Eat?